Iranian President Hassan Rohani has accused his critics among the conservative factions of the establishment of clinging to outdated ideas. This follows the harsh responses from hardliners in the Islamic Republic establishment, whom Rohani provoked by publicly stating that government organizations should reduce their interference in people's private lives. ISNA reports that on Thursday, the president referred to the critics of his cultural policies, saying: "What have we said to raise such confusion? We said culture belongs to the people and it is the people who can take steps toward cultural excellence." Rohani has spoken out against government enforcement of public dress codes and public behaviour. At the Tehran Book Fair, he also denounced overt censorship practices. Rohani has also expressed his support of opening up internet access for Iranians. He has been especially slammed by the Islamic Republic hardliners for saying people cannot be forced to choose the path to heaven under the lashes of a whip. Mashhad Friday Mass Imam Ahmad Elmolhoda has been quoted as saying in response: "Let alone a whip. We shall stand with full force against those who want to prevent people from going to heaven." 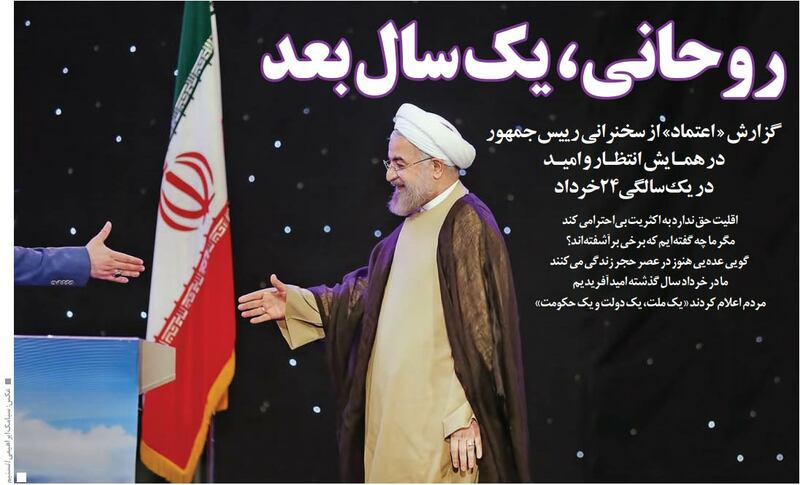 President Rohani dismissed the prescriptive approach to cultural issues in his Thursday speech, saying: "Do you think culture is a capsule we can prescribe so that people can buy it from a pharmacy and take it? Some people seem to be thinking in the framework of the Stone Age."